A few years ago at the TV Critics Association press tour my friend Neal asked NBC head Jeff Zucker why there weren’t any South Asians on ER. Anyone who has been to a hospital knows that they’re full of South Asians. Zucker replied that Ming Na was on ER. Na is Chinese. Fast forward to today and you have Parminder Nagra on ER. (One of these days they might even get her an Indian love interest.) Ironically, the Alec Baldwin character on 30 Rock (who is the show’s Zucker) has a South Asian assistant played by Maulik Pancholy. South Asians have made it beyond the stereotypical TV and movie roles of brainy computer geeks. You can find South Asian drug dealers (Pancholy in Weeds) and smart slackers (Kal Penn in Harold and Kumar Go to White Castle). Comcast offers Bollywood Movies on Demand. My parents are addicted to Netflix’s giant Bollywood selection. South Asians have made their mark on journalism, too. CNN features two South Asians in prominent roles, with Kiran Chetry anchoring its American Morning newscast and Dr. Sanjay Gupta as its chief medical correspondent. Ali Velshi has a slightly lesser role as a senior business correspondent and host of CNN’s Your Money. A research note: CNN’s official biographies of the three make no mention of their ethnicities. That in itself is great. Fareed Zakaria is the editor of Newsweek International and a frequent panelist on This Week with George Stephanopoulos. He is one of the sharpest minds in international relations. My friend Sree Sreenivasan, among many other accomplishments, is the tech reporter for WNBC-TV in New York. Indian influence has extended to the grocery. As India has industrialized and the demand for Indian food in the United States has increased, even ordinary grocery stores like Giant and Cub offer shelf-stable Indian food. My favorites are the shelf-stable vegetable dishes at Trader Joe’s. Combine those with the naan from the freezer section and you’ve got a complete Indian meal. Their pav bhaji lets you sample Indian street food without the stomach difficulties. There is a downside to all this progress: I don’t get as much made-from-scratch home cooking when I visit the parents. Instead of mom soaking and grinding the lentils for dosas, the batter comes from a mix. 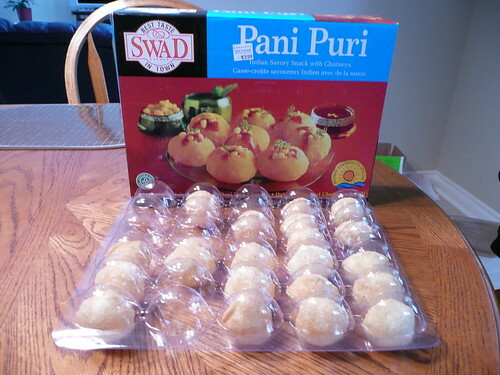 The puri for pani puri comes from half way around the world. India’s cheap labor and worldwide shipping means that you can buy a kit with 30 puris, filling, and sauce for $3.99 at the Indian grocer. That undercuts the local guy who sells his homemade puris at 20 for $5, without the extras. But mom knows I don’t like the boondi filling for my pani puri and makes my preferred potato filling. There are limits to progress.